I have been using Drupal since 6.x. Currently using D8 and supporting legacy D7 marketing sites. Prior to this I have applied technology (including a Drupal) to education for over twenty five years. Have been a strong advocate / supporter of Open Source since BSD Unix days and enjoy sharing things with others. 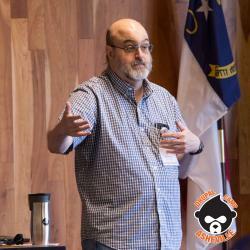 I have been a regular speaker at the Triangle Drupal Users Group and have presented 3 different talks at the Asheville Drupal Camp. Formerly a co-coordinator of the Triangle Drupal Users Group ( groups.drupal.org/tridug). Currently an Apache Project Management Committee (PMC) member for the Apache Org / DB / Torque project. In the past, I have help develop and support jForum (Java based forum system), created / managed the SourceForge Torque-Addons project, contributed jQuery plug-ins, and helped debug / report bugs for a wide variety of other OpenSource applications.